DDS - Sysops' Pets - Dogs! DDS - Sysops' Pet Dogs! Meet "Honcho", a beautiful Shar-Pei, courtesy of Marty Barel of The Wrinkles and Feathers BBS. Marty has sent us several photos of these unusal and attractive dogs and we invite you to take a closer look by clicking here for Marty's Shar-Pei's. 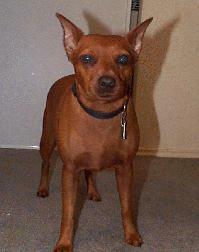 This is Rudy, a Min Pin, owned by Bryan Turner of Vagabond Software and Pegasus Flight BBS. Bryan has contributed much to the BBS world in the form of mainly freeware BBS doorgames and utilites and always has innovative ideas for new software. 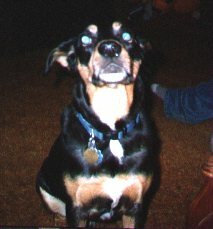 This is Shelby, a Boofer, owned by Shawn "Tiny" Highfield of Tiny's BBS. "Tiny's" BBS is also reachable via telnet and he has some great stuff online. Tiny has some special programs, most of which are freeware and has made some excellent contributions to the BBS world.